One advantage of a gluten-reduced, whole-food lifestyle, is that as I see people panic and prepare their Passover menus, I remain worry free. 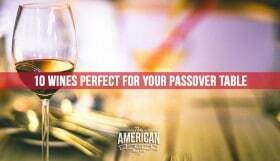 Passover has always been one of the healthiest weeks of my life. Produce rich, homemade foods for an entire week. 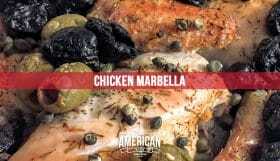 This recipe is one of those that you can make ahead for a large crowd as the braising liquid keeps the poultry moist, or you can serve for a wholesome mid-week dinner. I think this braised chicken dish is the high-point of everything I have ever braised. Do me one favor, if this red-wine braised chicken recipe makes it on to your Passover menu, please promise me you’ll serve it again during the year! Braising describes a method of cooking that begins with frying gently and then allows the food to stew slowly in a closed pot, or braiser. This method of cooking was popular in France in the Mid-18th century when a closed container of food was put on hot coals. 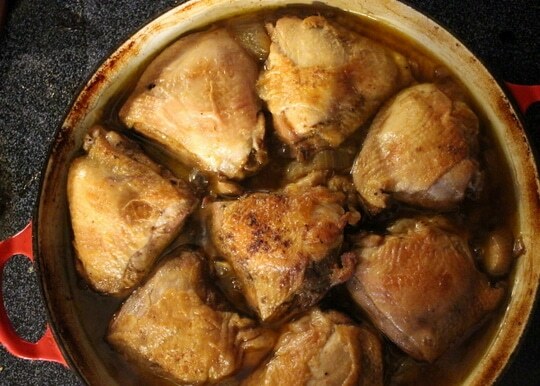 Braising became a particularly popular method of cooking in the Mid 1940s, and again in the 1980s. 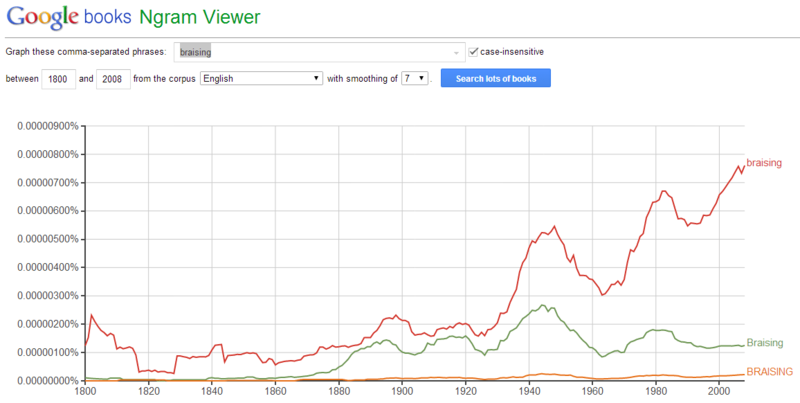 For the data geeks: This is the frequency that the word “braising” has been used in published books since 1800s. Search for the term “dutch oven” and you’ll see a similar pattern! As much as I love my Le Crueset Cherry Red Braiser, you don’t need to spend hundreds of dollars on a special pan for this to taste divine. Lodge offer a much more affordable alternative and this dish will also work well in any pan that is large enough to hold the ingredients and has a lid that seals nicely (like this one for less than $30). I started to embrace braising as a method of cooking this Kitchen Tested braised her Ouso Buco. If you’re not into the idea of braising chicken in red wine like I do here, you could always try apple cider instead or vegetable stock instead, although red wine is my go-to choice for this dish. 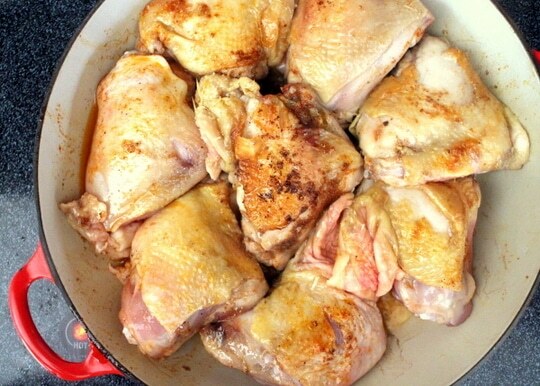 The first step to braising is making sure your chicken is dry before you season and fry it. I always used to skip this step thinking it didn’t make much of a difference. Seriously though, it does. Pat that chicken dry before you season it and you’ll get a lovely golden sear on the skin that will smell wonderful as it cooks and be crisp and flavorful as you take the first bite. Searing the chicken is a good first step as it will also lock in seasoning and flavors of the spices used. If you really want to be a pro, peel back the skin and season the flesh too, then pull the skin back over the chicken before frying. You are not looking to cook the chicken at this point, rather get a great color on it. Place it skin-side down and then turn it. Once it’s golden brown you’re going to remove it from the braiser so you can cook the beets and onions. Once these vegetables have started to cook, you’re going put the chicken back in the braiser, atop the beets and onions and add your red wine. 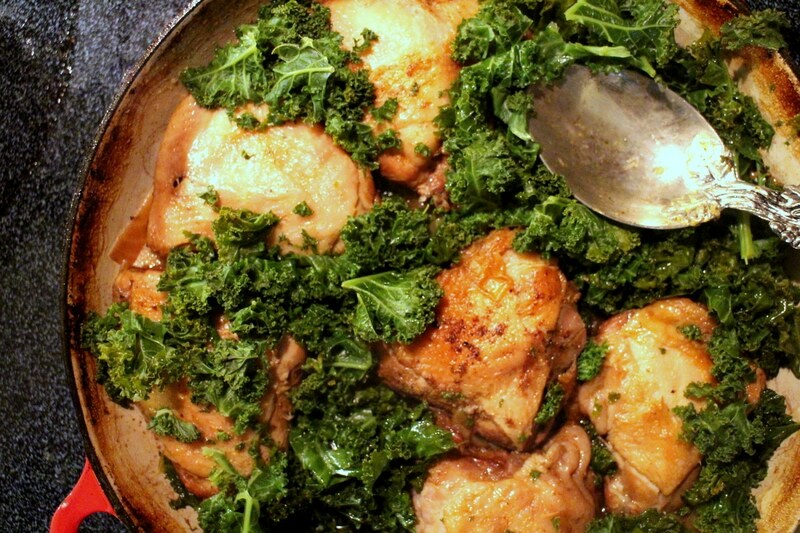 You’ll cover the pan and put it in the oven to cook, without the kale. That’s right, hold the kale till late. 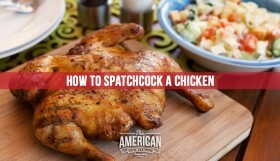 You want your chicken to look something like this first. You want to keep the kale out of the oven for most of the cooking time because it will cook much quicker than everything else. By adding it to the braiser just fifteen minutes before serving this dish, it will keep its vibrant green color and shouldn’t wilt too much. I had as much fun writing this recipe up as I did making and eating it, so please tweet me a photo of your version when you make it too. You can also tag @thisamericanbite on Instagram or Facebook. 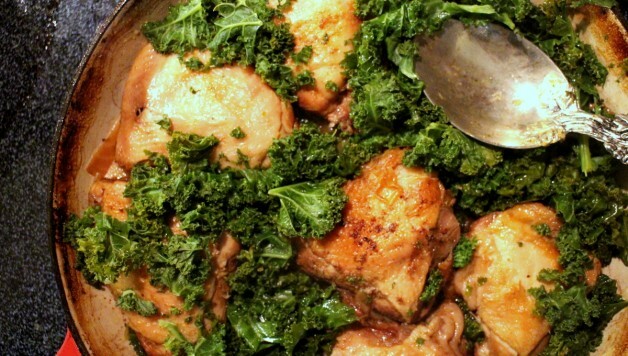 Inspired by “Google’s Braised Chicken with Kale” found here, here and here. 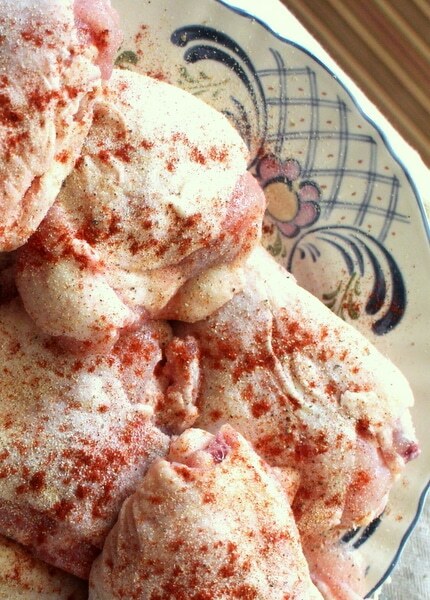 Sprinkle chicken with paprika; season with salt and pepper. Heat oil in a large braiser on pan over medium heat. Add chicken skin side down and cook, turning occasionally, until brown on all sides, 7 minutes per side then transfer to a plate. Add onion and garlic to pot and cook until softened. This will take about 10 minutes. 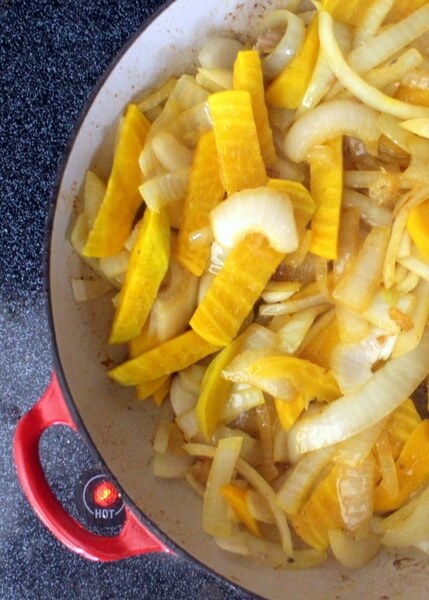 Add the slices of the golden beet and cook for another five minutes. Return chicken to pot and cover with red wine. Bring to a boil then cover. Reduce heat and simmer for ten minutes. Put in the oven at 350 degrees for two hours. 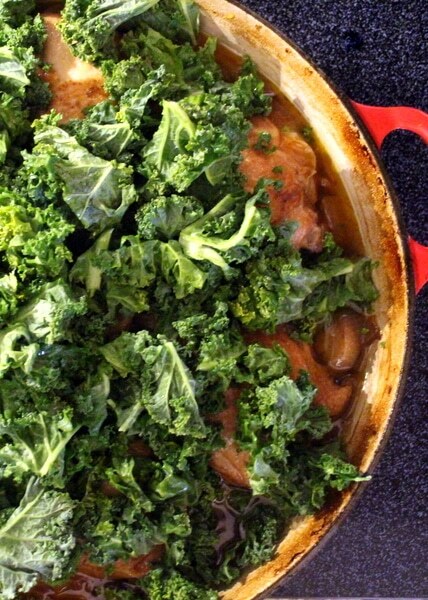 Add kale to braiser and cover. Cook for no more than fifteen minutes. 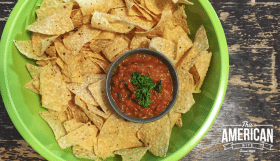 I served this with roasted potatoes and a Middle Eastern spicy condiment called schug which you can find the recipe for here. 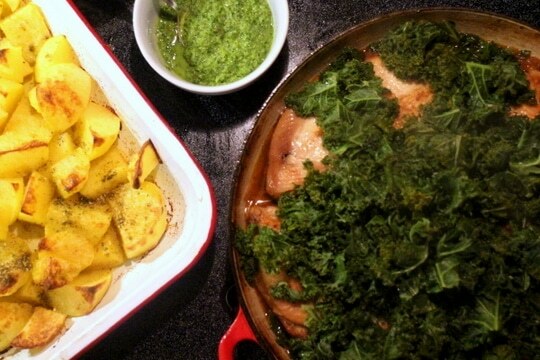 Chicken braised in red wine with golden beets and kale, served with roasted potatoes and schug.